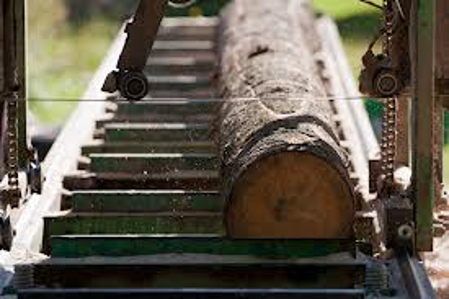 Newly-cut logs can have a moisture content (MC) of 80% or more, depending on species. Since wood shrinks, splits, twists or otherwise change shape as it dries, most wood is dried before being used. This is most often done using a kiln or the air drying method, which is a much slower process. In North America, the minimum moisture content generally obtained by air drying is around 12 percent. Most air-dried material is usually closer to 20 percent moisture content when used. Kiln drying is usually monitored by some type of moisture meter. Moisture meters are used to measure the amount of water in the wood so that the woodworker can determine if it is suitable for the intended purpose. 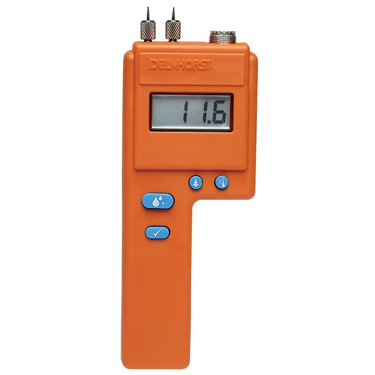 Building inspectors, many carpenters, hobbyists, and other woodworkers often are required to have moisture meters. Wood flooring installers, for example, have to verify that the MC of the wood matches the relative humidity in the air of the building. If this step is skipped, a vast array of problems may present itself: cracking, cupping, crowning, buckling, sunken joints, and cracked finishes. The problems caused by varying degrees of moisture content in wood go beyond simple shrinkage in the dimensions of wood parts. 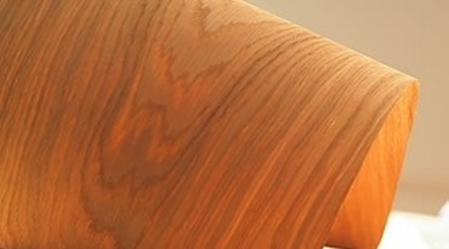 Problems with distortions in the shape of the wood, such as twisting, warping and cupping, occur because of the difference in the degree of dimensional change in wood cells tangentially versus radially. 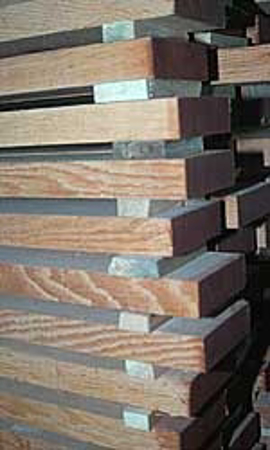 The amount of overall shrinkage that lumber will undergo in the drying process varies from wood species to wood species. The difference between radial and tangential shrinkage also varies from species to species. 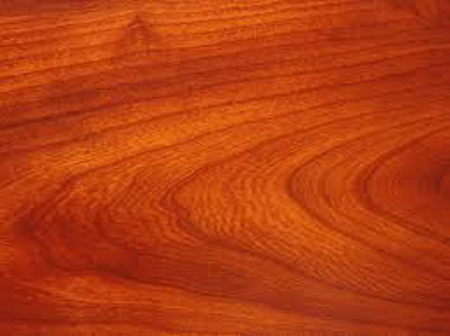 Woods with a low ratio of tangential to radial shrinkage, such as teak and mahogany, are less prone to distortion due to changes in moisture content than woods with a high ratio, such as eastern white pine and certain species of oak. Species with both low overall shrinkage and a low tangential/radial shrinkage ratio are more stable and will react better to changes in moisture content. For wood that is to be used in making furniture, for wood floors, in construction or for any building project, the ideal state is one of equilibrium moisture content (EMC). EMC means that the wood is in balance with the relative humidity of its surrounding environment, and is therefore neither gaining or losing in moisture content. In reality, however, it is extremely rare for an environment to maintain a constant fixed relative humidity, and some degree of dimensional change along with seasonal changes in relative humidity is to be expected. 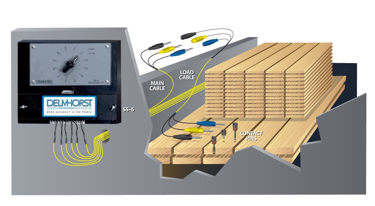 A moisture meter gives a reading of the approximate moisture content of wood. The reading helps in determining whether the wood is suitably dry for its intended purpose. 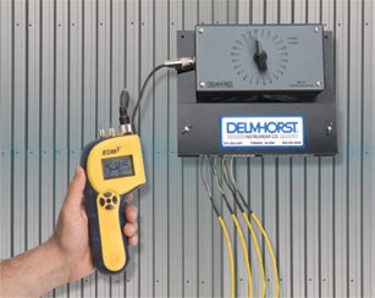 The moisture content reading can also assist in planning a project design that will accommodate future changes in dimension caused by changes in relative humidity. For typical woodworking operations, two basic types of moisture meter are available. One type measures the electrical resistance of the wood fibers, which becomes increasingly lower as the moisture content of the wood rises. 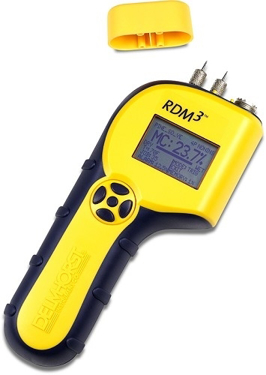 With the electrical resistance type of moisture meter, two electrodes are driven into the wood fibers and the electrical resistance is translated into moisture content on the device’s electronic or dial output. The second type of moisture meter relies on the dielectric properties of wood and requires only surface contact with the wood. These two types of meters are also known as "pin" and "pinless".